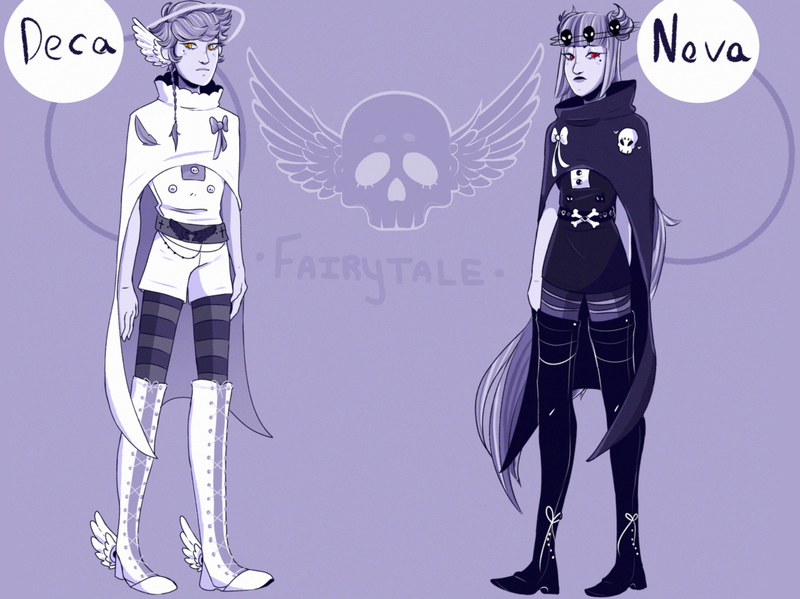 Twins twelve years of age, December and November... Or Deca and Nova as they commonly introduce themselves to others, are the children of Rapunzel. Their late mother however, is no longer with us, and instead the two are now raised by the enchantress who had raised their own mother. The two tend to stay at home except when on errands from their caretaker. The twins give off an overall aura of perfection, and a seemingly lack of emotion of any sort. They care much about their appearance, requiring everything to be impeccably perfect. In a way, showcasing emotion is foreign to them, and is considered to be something forbidden. If one of them starts to react more than they should, or have a tantrum of any sort, the other will be quick to threaten the other, telling them how most definitely mother would be upset. Quite possibly the most common reactions to see from them are cold dead stares, cruel amusement, and disgust. Working perfectly in sync, the twelve year olds commonly are sent on errands for their mother. They remain rather indifferent and avoidant of outsiders, as they go about their life. Deca and Nova possess abilities allowing them to manipulate the forces of life and death to their will. Deca is strictly a life-force manipulator; this ability is accessed through touch and spells alike. Deca may take control over most aspects of life itself aside from taking it away in an attempt to kill, this is Nova’s ability. His powers lie in the capability to bring inanimate objects to life such as water, rocks, etc. and use them for whatever he wishes. He is also able to give life to dead organic matter such as plants, and dead animals. Attack-wise he may draw life force from surrounding plants and animals to generate forms of energy that could be life threatening to others in the form of beams/ bolts; it performs similar to electricity. Likewise, he can create defensive fields from the same sources. In order for the twins to strengthen their abilities, they must use more emotion than their usual demeanor commonly will allow them. For example, if someone is to injure the other, the uninjured can become dramatically more powerful. However excess of an emotion can cause their abilities to work outside of their control, maintaining as to part of why they usually remain rather stoic. The twins also have the ability to hover at will. Deca and Nova are powerful, although, they have their limitations. These limits act similar to AP within games; the twins use their own life energy to conduct spells and it can drain them immensely. Their own life forces can regenerate over time but is capable of being used up faster than it can return, so they must use what they can sparingly. Killing/ bringing small creatures instantly back to life is not too hard on the twins but performing their abilities on a larger life force is seemingly more difficult. For example, taking/ bringing life back to a human being can take nearly all the twin’s life force, therefore putting them in an extremely weak position.